National Association of Productivity and Organizing Professionals® (NAPO®) has a membership of approximately 4,000 organizing and productivity professionals dedicated to helping people and organizations bring order and efficiency to their lives. NAPO’s mission is to be the leading source for organizing and productivity professionals by providing exceptional education, enhancing business connections, advancing industry research, and increasing public awareness. 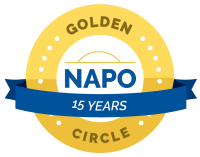 NAPO Professional Members who have been members for 15 or more years are recognized for their commitment to the profession by receiving the NAPO Golden Circle designation. These veteran members have the opportunity to attend local Golden Circle meetings and events, attend a special Golden Circle-only session at the NAPO Annual Conference & Organizing Expo™, and receive a digital web badge to use in their brand marketing. NASMM's Circle of Service designation was established to recognize our members who have attained an elevated level of experience and expertise. The Circle of Service is awarded to NASMM veteran members who have been a member, in good standing, for a minimum of 10 years. The NASMM A+ Organizational Accreditation Program recognizes organizations for achieving a level of competency in Senior Move Management through demonstrated best practices in Senior Move Management client services and business management, coupled with industry contributions. NASMM A+ Accreditation represents the highest level of professional achievement that can be awarded to a Senior Move Management company, and demonstrates the organization's substantial conformance to NASMM standards. An organization receiving a three-year NASMM A+ Accreditation has put itself through a rigorous peer review process. A NASMM A+ Accredited Senior Move Management company has demonstrated to a team of reviewers its commitment to offering programs and services that are measurable, accountable, and of the highest quality. The NASMM A+ Accreditation is awarded through the NASMM A+ Accreditation Commission. The NASMM A+ Accreditation Commission is the independent, nonprofit accrediting body of the National Association of Senior Move Managers. It's mission is to promote the quality, value, and optimal outcomes of Senior Move Management services through a consultative accreditation process focusing on enhancing the lives of the persons served. Faithful Organizers® is a community of Christian Professional Organizers. We seek to fulfill our calling by honoring Isaiah 32:18 and providing our clients a place of rest at home, at work and in their hearts. Faithful Organizers® contributes to the spiritual and professional growth of members through education and fellowship.